Nepal. Recommended. Traditional subsistence farmers in Nepal. The ones who, for various reasons, and with varying degrees of acceptance, are still there; having not emigrated to America, not moved to the city, not pursued education. I’m just a sucker for movies like this. There are no bravura performances or points of high drama. 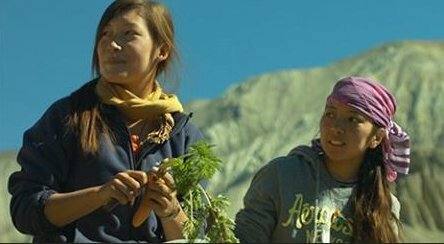 The movie was shot on location in an area called Mustang, and was written and performed by people from the area. So the amazing landscapes, the un-polished depiction of the culture, and the account of the choices available to the residents have the virtue of seeming quite real. There is a scene of a traditional celebration and dance that is not nearly as cool as it would be presented in a more polished film, but is very cool in that it just seems to be the genuine article. They start a little awkward in the presence of the camera, I think, but loosen up as they get into the dance. Beautiful people. Nice people. No bad guys in this movie.